An educationalist and generous local benefactor helping both the Church and individuals. Portrait courtesy of Peter and Heather Clark, 2011. Known formally as Mrs Buck in the village, she was born Marian Walker, at Birstall near Leicester in 1851 the daughter of a boot and shoe manufacturer. When she was young, her father brought her to stay at Stanley Hill in Bosbury and she must have retained a love of the area despite later travelling widely in Europe as an artist explorer. She married Dr. William Elgar Buck in Leicester and they founded the Leicester School of Cookery in 1877 which became the North Midland Training School of Cookery in 1890 carrying out teacher training. The Bucks had no children and when her husband died in 1886, she moved back to her family in Birstall to look after her elderly parents. She stayed as Hon. Secretary of the School of Cookery for a further ten years and wrote three cookery books. When her parents died she moved to Camp End House near British Camp and, together with Misses Anna Brander and Mary Worthington, founded a girls Residential School for Household Training at Evendine Court. After she and Miss Brander retired the school became a convalescent home. Marian Buck owned land and properties in Bosbury including Harbour Hill, Upper House, Noverings Farm, Little Noverings, Littlecroft and Maycroft, Hollymount and The Noverings which was her final home. She had architectural interests and influenced the design of The Noverings built in 1907 and Littlecroft and Maycroft built some time later. In 1911, Mrs Buck bought the Old Vicarage by the church from Willoughby Baskerville Mynors of Bosbury House. In 1916 she made a gift to the parish council of a small strip of the vicarage land adjoining the churchyard for a site of a war memorial on the main street. She allowed the Old Vicarage itself to be used for many years as the Parish Hall Club Rooms but, on the 30th of July 1945, she gifted it to trustees to hold in a charitable trust for the benefit of the community in the Parish of Bosbury. The trustees decided to demolish the old building which was in a poor state of repair and build a new parish hall. 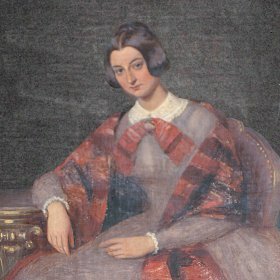 Mrs Buck had a companion and close friend, Janet Margaret Beith who lived with her at The Noverings and she also employed a chauffeur, Samuel Jones. Late in life, she visited North America four times accompanied by Miss Beith. They sailed from Liverpool on 23 June 1923 to Boston and returned from New York on 22 July. They travelled in first-class luxury on the White Star Line. Two years later they visited Quebec and in 1928 Montreal. Their last visit to New York was in July 1931 when Mrs. Buck was 80 years old and her companion 51. Mrs Buck died on 2nd June 1947. In 1957 a a memorial window to her showing St Michael the Archangel was set in the north wall of the Church. Sources: Jean Buchart Ninety Years On. A history of Evendine Court. Census records Marian Walker was aged 10 and staying with her Uncle in Ardwick, Manchester on the 1861 census, and unmarried and visiting London in 1871. In the 1881 census she is married but visiting her parents at The Holt, Birstall. Living at this address in 1891 and 1901, she is noted as a widow living on her own means. Researched by Barry Sharples, 2011-2016.